I made this card for this week's color challenge on Splitcoast. We were to use Elegant Eggplant, Ruby Red and Certainly Celery. I used the main flower image from the Heartfelt Thanks set by Stampin' Up, and colored it in with my eggplant, ruby, and celery markers. I stamped the outline over it in eggplant and always artichoke using my Stamp a ma jig. I used my ticket corner punch on the white and the celery cardstock, and mounted them on the ruby red cardstock. I added the gold brads and attached it to my eggplant card base with dimensionals. 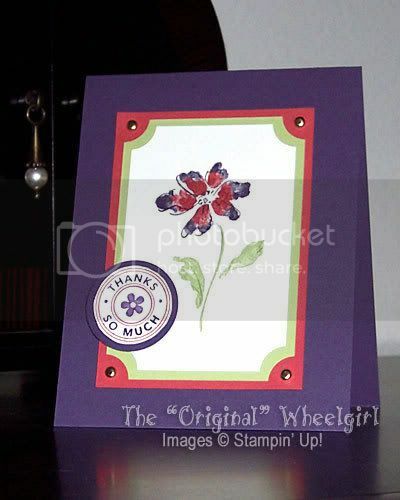 For the circle accent, I used my markers to color in the Thank You Very Much stamp from the Riveting set by Stampin' Up, then cut just outside the line. I need to get the 1 1/4" circle punch, as it would have been MUCH easier. Then I mounted it onto a 1 3/8" eggplant circle, and attached with a dimensional. One more step would have made this perfect for the sketch challenge this week, except I couldn't figure out how to attach the strip across the center front without covering up most of the flower. Oh well. Isn't it funny how you can stumble across a technique or design and you just get obsessed? 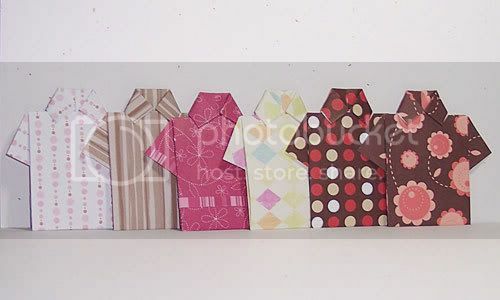 This week's technique challenge was to make an origami shirt out of designer paper. 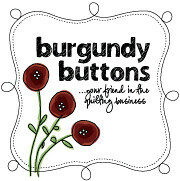 Cambria Turnbow (a very talented lady I might add) has an excellent tutorial on her blog. The step by step pictures are very helpful. I've made several of them, although I have had yet to make a card using them. But aren't they adorable? Hopefully soon I can put them to use. Enjoy!